Best Kids Picnic Table for Children to Eat, Play, and Hang Out! 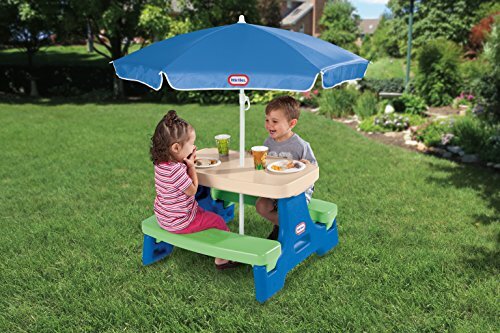 After taking a close look at several kids picnic tables, we’ve found that the best kids picnic table is the KidKraft Wooden Picnic Table with included benches and umbrella. It’s quite expensive, but it’s very well made, and frankly looks better than many adult-sized outdoor furniture sets! Your kids will be protected from the sun and will want to spend all their time on this picnic table, drawing, eating, and playing. Just be sure to treat it as you would any other piece of wooden outdoor furniture. Cover it during inclement weather, and store the umbrella when not in use. The runner-up on this list is the Lifetime 280094 Picnic Table. The Lifetime 280094 is extremely durable, sturdy, will last a long time, holds a lot of weight, and is all-around easy to clean and inexpensive. It even has a warranty included, which is great for buyers who worry about receiving a low-quality product. The table even folds, so adults can take it anywhere. Unfortunately, there’s no umbrella included, nor is there a hole for an umbrella. 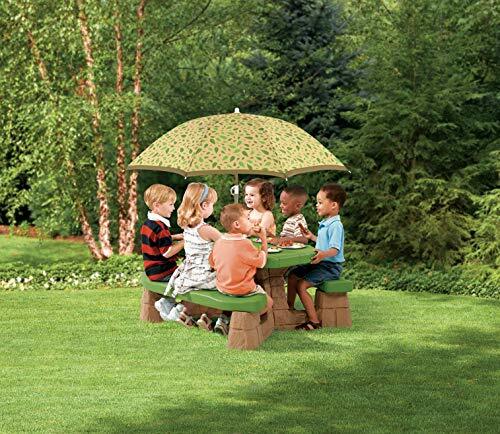 Finally, the budget pick is the Merry Garden Kids’ Wooden Picnic Bench. This kids’ picnic table is the least expensive option on the list because the buyer will need to finish and seal the wood themselves as well as put the product together. However, this gives the owner room for flexibility and creativity. The buyer can make it waterproof, weatherproof, or cover it in a design their children love while investing significantly less money than required for other products. For these reasons, it is this list’s clear budget option. There’s no hole for an umbrella here, but if you can work around that, it’s a great budget choice. There are a few major aspects to keep in mind when shopping for a kids’ picnic table. These include the material the table is made of, the ease of storage, whether or not an umbrella is included, and what sort of warranty is included. We’ll look at each of these items here. Sun exposure is often a significant concern for kids’ fragile skin, so having built-in shading can be a huge advantage when it comes to an outdoor picnic table. It’s one less concern when letting the kids play outside if they’re going to be under a UVA and UVB-protected canopy. Some of the listings include an umbrella, while others do not. Unfortunately, the ones that don’t include an umbrella don’t even include a hole for you to insert an umbrella. So if you are worried about excess sun exposure, be sure to keep your picnic table in a shaded area, or choose a model with an umbrella. The materials the table is made of are perhaps the most important single factor to consider. Common materials are resin plastic, and wood. Wood needs to be maintained but generally looks the best, while resin plastic can look cheap, but is usually bomb-proof. Many parents like to avoid plastic toys and pieces for their children, but when it comes to outdoor furniture, plastic has its merits when it comes to durability! You will want to consider how durable you want your table to be. The plastic tables are going to tend to be more durable than wood, though wood will be plenty strong enough assuming they’re kept up properly in terms of staining and painting. None of these tables are small, and many require significant assembly. We try to touch on assembly difficulty when looking at each of the tables on the list, but the difficulty can range from essentially no assembly, just unfold and voila! to ugh, who wrote these directions?! If you hate assembly, you may want to lean toward one of the easy-folding models. Some will want to leave their kids’ picnic table set up on the patio all year for the kids to play on, while others will want to fold and unfold as needed. Some may want to bring their table inside when the weather gets nasty. Regardless, you should consider the ease of storage, and whether you need a table that folds up for storage. Some of the items on our list are covered under great warranties, while others don’t have any guarantee more than the usual 30 day return policy. Consider how imporant a warranty is to your purchase needs. Everyone loves their children and grandchildren and wants to encourage them to learn, grow, and experience the world around them. Sometimes it can be difficult for kids because the world isn’t quite made for them. Furniture and regular objects tend to be too large for them, and adults might not want the children to play on their expensive, high-quality furniture or equipment. When this is the case, individuals can turn to specially made furniture designed for a child’s small arms and legs. In particular, more and more companies are now making small picnic tables for kids to eat on, play with, and otherwise be comfortable sitting at. But which table is the best? And what should adults look for? Here we’ll look at six of our favorite children’s picnic tables. We’ll start this section with a comparison table to get oriented, and then go into our six selections for kids outdoor picnic tables. We’ll conclude with our favorites. Product Dimensions: 35.0 x 31.0 x 19.6 in. Each Bench Holds Up to 100 lbs. 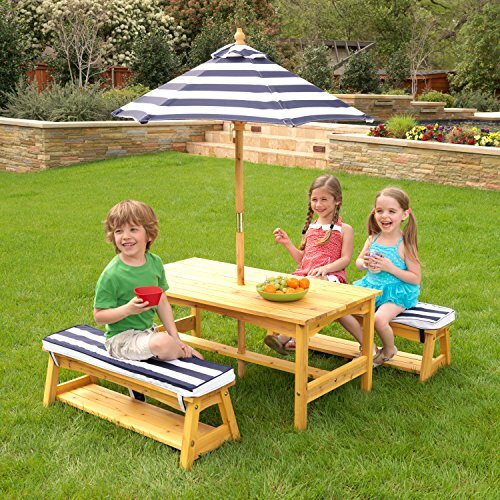 The Merry Garden Kids’ Wooden Picnic Bench is a miniature version of an adult picnic table capable of seating four children between the ages of 3 and 8. Each bench on the sides of the table can hold a maximum of 100 lbs. and provides enough leg room for the average child. It does not fold up for storage. This picnic table is unfinished and made from Canadian Hemlock. The idea is that buyers will be able to paint or seal the wood as they wish to be extra creative for their children’s picnic table, which is really a sweet idea, and one we very much like. The Merry Garden possesses a traditional, classic look and weighs a low 17 lbs. The wood is durable and resistant to damage, but it should still be sealed to prevent staining and weather damage. There’s no umbrella included with this package, nor is there a hole in the table for an umbrella to be inserted. One of the big issues with this table is that assembly is required, and the assembly is not insignificant. Be prepared, and get those batteries charged on your electric drill. Also, when assembling this table, be sure to get each of the bolts started, and then go back and do a second round and tighten everything up. By doing this, you’ll ensure that the holes are all lined up, saving you major headaches. The Merry Garden is not weather resistant or waterproof upon purchase, so buyers will need to invest some time in this particular picnic table to prep it for outdoor use. Stain or paint, and it will look fantastic! Naturally, one of the biggest drawbacks of the Merry Garden is that some assembly is definitely required beyond putting the pieces together. While this gives the buyer more creativity when it comes to the finish, it can also be annoying for people who want a complete product. However, for the price and quality, the Merry Garden definitely makes up for its need for a little elbow grease. For those reasons, it is this lists budget pick, especially since it is the least expensive. Holds a Maximum Weight of 300 lbs. Product Dimensions: 72 x 43 x 40.75 in. 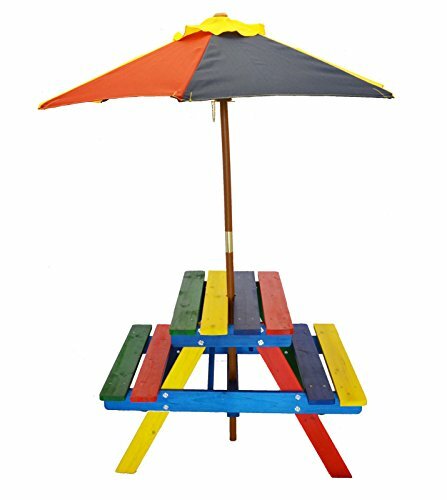 The Step2 Naturally Playful Picnic Table with Umbrella (Step2 Naturally Playful) is a simple yet creative picnic table for children between the ages of 3 and 8. It comes in two separate patterns that are bright, colorful, and appealing to kids. 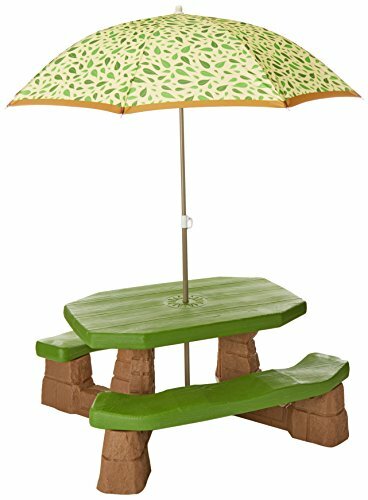 The picnic table mimics realistic sandstone and limestone and comes in a vibrant tree design with an adjustable umbrella that can be removed as needed. The umbrella does provide extra protection from UVA and UVB rays and has a UPF rating of 40+. The umbrella measures roughly 5 ft. in diameter. The Step2 Naturally Playful is made of durable, easy to clean plastic and comes with a manual for setup and care. There is ample legroom for the average kid and minimal assembly is required. The table weighs 30 lbs. and can seat between 4 and 6 children, though the max. weight is 300 lbs. The material and coloring of the table does appear to be fade-resistant for roughly 6 months to 1 year. This is a great table for the money, and one of the most durable on this list. The only drawback is that the surface isn’t completely flat. It’s a bit ridged and rugged, which makes coloring and drawing difficult for kids. However, the construction is solid, the price is reasonable, and warranties are available. All around, the Step2 Naturally Playful is worth the investment and can seat many kids at once. Product Dimensions: 32.5 x 19 x 19 in. The Lifetime 280094 Kid’s Picnic Table (Lifetime 280094) is a sturdy and durable children’s picnic table that avoids frills and instead focuses on stable construction. The table has full dimensions of 32.5 x 19 x 19 in. and can a maximum of 4 children. There’s no umbrella included with this table, and there’s no hole in the table for a user to insert an umbrella. If shading is high priority for you, you may need to figure out a different shading option or choose a different table. Unfortunately, the manufacturer does not list a weight limit but buyers can use common sense. Each product comes with a 2-year limited manufacturer warranty that will cover some basic damage as well as manufacturer errors. The Lifetime 280094 is made from high-density polyethylene that is waterproof, stain-resistant, and UV-resistant. This means the surface and appearance of the picnic table will not warp or be eroded by the elements if the buyer chooses to put the table outside. The table is available in white and lime green and comes in a rounded-rectangle shape. The entire table can be folded up for easy transport and weighs a low 21 lbs. The legs of the table are made of powder-coated steel for extra strength. 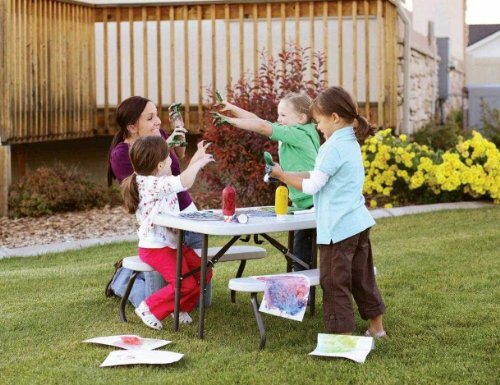 The Lifetime 280094 picnic table is simple, durable, and honestly one of the best options to have around children. It’s weather-resistant, water-resistant, stain-resistant, and all around childproof, meaning it will last for years after the initial investment. Many find that even 5 years after purchase, with kids regularly using it, the table still looks the same as it did upon purchase. Added to all of these facts is that the Lifetime 280094 comes with an included warranty, and it’s easy to see why the Lifetime 280094 is this list’s top pick for buyers who don’t need an umbrella with their table. Product Dimensions: 34 x 14 x 4 in. 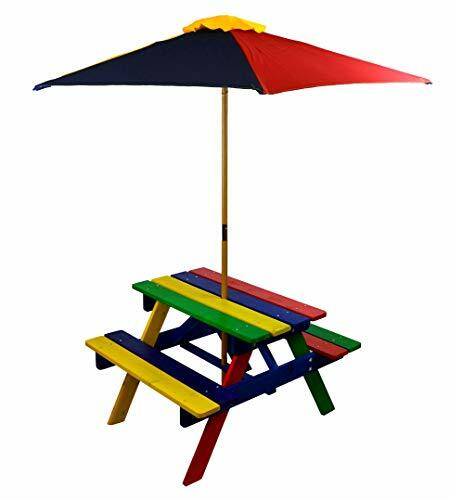 The Home and Garden HGC Junior Rainbow Kids Picnic Table Set with Umbrella (HGC Kid’s Picnic Set) is a small, brightly colored picnic table with full product dimensions of 34 x 14 x 4 in. The table is capable of seating between 2 and 4 small or young children and weighs roughly 15 lbs. An adjustable and removable umbrella is included and stands roughly 53 in. tall. It sits in the center of the table but cannot be adjusted to either side. This particular picnic table is one of the most brightly colored currently available and is made of solid hardwood. It is finished in primary blue, yellow, red, and green with each slat of wood being a different color. Some assembly is required upon delivery, but the HGC Kid’s Picnic Table does come with instructions and rust-proof bolts. The table is finished, but you’ll want to keep an eye on the finish if you leave it outside. It’s weather resistant, but over time will need work to keep it up. In general, the HGC Kid’s Picnic Set is visually pleasing and will be fun for kids, especially since it includes an umbrella for sun protection. The main downside is that the table appears to go for fashion over function, and the hardwood and paint is not as durable as other options available at the same price point. The table is also quite small and is targeted for children under 5 years of age, so kids will outgrow it quite fast. For these reasons, the HGC Kid’s Picnic Set did not make the top of this list. Product Dimensions: 29.5 x 25.3 x 18.5 in. 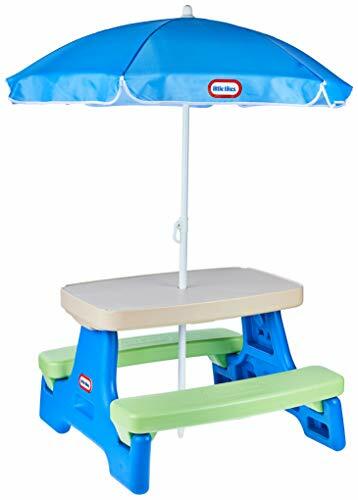 The Little Tikes Easy Store Junior Picnic Table with Umbrella is a durable plastic picnic table designed for children between the ages of 1.5 and 5 years of age. It’s quite easy to clean and take care of, which is a helpful benefit for a kids outdoor table! It folds up for storage, and weighs about 15 lbs. Some assembly is required with this one, but it’s not a huge job. The benches are connected to the table part, and each bench can hold a maximum weight of 50 lbs. Overall, the whole table should seat between 2-4 children. The table is quite small; the full product dimensions are 29.5 x 25.3 x 18.5 in., so there is not a lot of legroom for children who are particularly tall or heavy. A blue and white umbrella is included with this model and provides some protection for children from the sun. The umbrella is removable. Having available shade is always a plus when considering a kids picnic table! The plastic design of the table is in alternating tan, green, and blue. However, the color of the plastic might fade from too much sun exposure. Regardless, it shouldn’t erode. The Little Tikes Table is simple and easy to clean, two qualities that parents look for in their children’s possessions. All in all, this particular picnic table is a solid investment. However, it can’t hold much weight and is quite small, so it’s likely children will outgrow it fairly quickly. 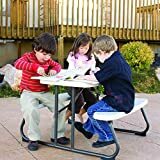 Since there are tables that are larger and can last longer for around the same price, the Little Tikes Table didn’t make the top of our list. Product Dimensions: 42.1 x 22.8 x 19 in. Bench Maximum Weight Limit of 250 lbs. 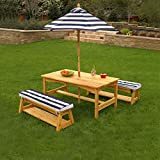 The KidKraft Outdoor Table and Chair Set with Cushions and Navy Stripes (KidKraft Table) is a solid, sturdy picnic table that is full of style and has a much more “grown-up” look than most of the other picnic tables on our list. It has full product dimensions of 42.1 x 22.8 x 19 in, and is made for kids between the ages of 3-8. The package comes with a finished and sealed table, as well as two benches with cushions. The furniture is made out of hardwood and has a finish in a warm honey color. KidKraft’s table and benches are waterproof and weather resistant, though you’ll need to keep up the finish. An adjustable umbrella is also included for extra protection from the sun and its harmful UVA and UVB rays. The umbrella can be removed for storage, or if you want to use the table indoors. You’ll likely want to get a patio furniture cover for this set. Cover it in winter, and ideally even for rain. Keep an eye on the finish, and be prepared to refresh it as needed. It is made of wood and should be treated like any other piece of outdoor wooden furniture. 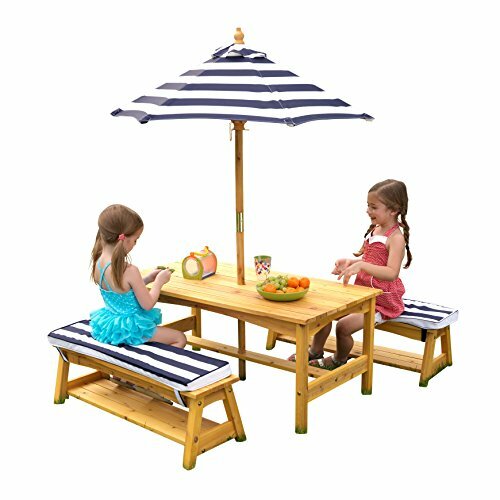 Unlike a lot of other products on this list, the KidKraft Table comes with a comfortable navy and white striped cushions so children can sit and play for longer. The cushion design matches the umbrella, making the whole package fit in a way that the other setups on our list don’t offer. 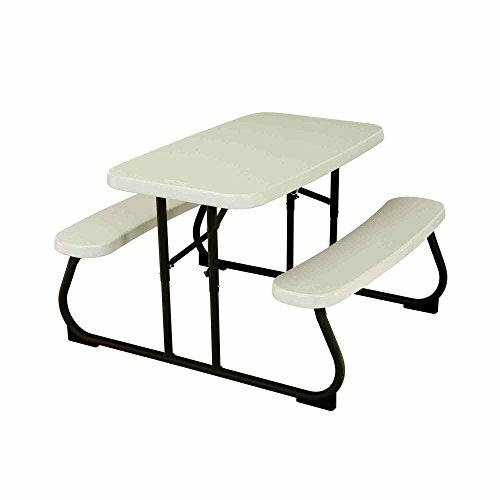 The picnic table seats between 2-4 children, and each bench has a maximum weight limit of 250 lbs. The table weighs roughly 44 lbs. and comes with instructions included to explain how to build the table. A small wrench is also included in the packaging. A KidKraft Table should last between 3-4 years if properly cared for. The KidKraft Table is far more expensive than the other options currently available for children but is also one of the most visually appealing. The hardwood is sealed and colored beautifully, the cushions add extra comfort, and the umbrella is reasonably well-made. 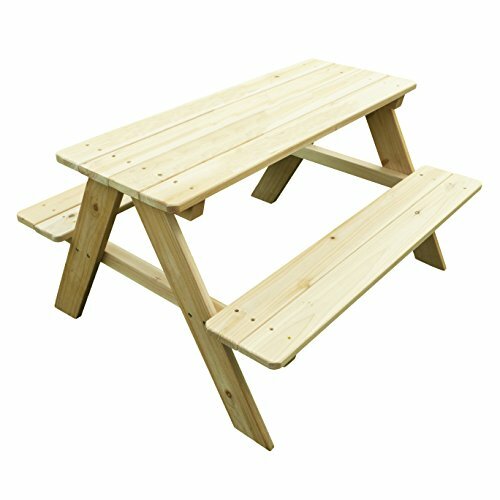 This is the best outdoor picnic table for kids, and feels like a piece of furniture many adults would love! Just be sure to care for it, and don’t treat it like a resin plastic table. Fold up the umbrella and store it when not in use, and cover the table during inclement weather. If you treat it well, the KidKraft will be the place your kids want to sit, eat, and play for years to come! In a world not built for children, adults often end up building their own worlds for their little ones. A big part of this is ensuring kids can sit comfortably at furniture that is their size and made for their bodies. Kids’ picnic tables are a great way for children to play and enjoy the outdoors while still being comfortable. Out of the ones reviewed here, the absolute best is the KidKraft outdoor picnic table with benches. Its overall styling and included umbrella make it a great choice, assuming you’re willing to treat it as you would any other piece of outdoor wooden furniture. As a super-resilient backup, the Lifetime 280094 is a great choice because of its mix of quality and affordability. For those on a budget, the Merry Garden picnic table is an excellent choice, just be prepared for a little extra work in assembly and finishing.